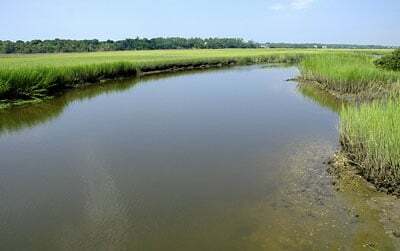 Typical Carolina lowcountry tidal marsh environment. FIRST OFF, let me admit that I’m a Yankee, or rather I was until a couple of years ago when we moved to coastal South Carolina and were adopted into the Lowcountry. Though not a Southerner by birth, we do feel at home. After guiding shallow-water anglers for many years in New England, I figured I could handle these Carolina spottails and trout with relative ease. Turns out, they are much tougher to catch on flies than our New England striped bass are, at least for a newcomer. But I am learning, and finally beginning to consistently land fish. Although I have used many of the proven local techniques, it’s only natural to try some of our successful northern tricks on these southern fish. In New England, most saltwater fly-fishing guides use fast-sinking, shooting-head fly lines when targeting striped bass and bluefish. This is true whether they are fishing in cold, springtime water for schoolies; in summer conditions during low light or bright sunshine; and even during the fall migration when most of the action is on surface-blitzing fish. About the only time that sinking shooting heads are not the most appropriate saltwater line for New England waters is when fishing with a popper or Gurgler. In the Carolinas, however, very few shallow-water anglers use shooting heads. The local fly fishermen I’ve met typically either don’t know about shooting heads or don’t like them. Fly anglers with extensive freshwater backgrounds are among those who do not like shooting heads, many of whom are used to the smooth and easy casting stroke employed on calm fresh waters. They especially dislike the hinge effect at the point where the weighted portion of the line connects to the running line. For those accustomed to weight-forward, tapered lines, shooting heads can be awkward at first, requiring a slightly different casting technique. And yet other anglers may have heard about sinking shooting heads but think they are the same as a sinking-tip line or a combination line with interchangeable tips. They are not the same. The lines I use are properly known as “integrated” shooting heads, as now found in the lineups of most manufacturers. They consist of a heavy front section called the shooting head, which averages about 30 feet in length and is bonded to about 60 or 70 feet of thin intermediate running line. The bonding is the key because it reduces any hinge effect and the joint slides through the rod guides easily. And this is why they are called integrated lines, as opposed to interchangeable shooting lines that employ a loop-to-loop connection. Personally, I use only the integrated shooting heads. The multi-tip shooting heads that come with floating running lines don’t go as deep and are not as effective in fast current. They should work fine for shallow flats, however. And multi-tip lines with intermediate running lines should work anywhere. Manufacturers also have improved the loop connectors to reduce the hinging effect when casting, but I would suggest that, overall, multi-tip shooting heads compromise effectiveness for versatility. A fast-sinking, integrated shooting-head fly line typically consists of about a 30-foot high-density head followed by an intermediate running line. This is different from a sinking tip line, which offers only about 15 feet of sinking tip in front of a floating line and will not get down as well as the integrated shooting heads. Nor will a sinking tip cast as far. Most major manufacturers offer sinking shooting heads in a variety of weights. In general, the author recommends the following guidelines for modern fast-action rods. For slower actions, go about 50 grains lighter. Fast-sinking integrated shooting heads are generally rated by sink rate and line weight (150-grains up to about 600-grains). Certain weight lines are more appropriate for certain rods. (See table.) For instance, a fast-action, saltwater 8-weight fly rod best handles a 300- to 350-grain line. It can throw a 400-grain or heavier line, but not comfortably. Why do northern guides use them? A guide’s job is to find more and bigger fish for experienced anglers, but many of their clients are either new to fly fishing or new to saltwater fly fishing. If a guide wants to take a saltwater neophyte and have them catch a striper on a fly within a half-day charter, then the learning curve must be quick. The quickest way is with a shooting head. On saltwater, wind is almost always present, and even journeyman fly anglers can become disconcerted in a 15-knot breeze. No line shoots through the wind as efficiently as a heavy shooting head. If these reasons seem oriented toward those less familiar with salt water, then why do so many striper guides use shooting heads themselves? The answer is efficiency. An expert with a shooting head can pick up a line after an unsuccessful retrieve and deliver it back into a productive spot with minimal false casts, thus keeping the fly in the water longer. One or at most two false casts are all that is required to shoot 60 feet of line toward a new productive spot. So far I have found three situations in the Carolina Lowcountry where fast-sinking, shooting heads definitely outperform any other line. The first is in cold weather when winter finds tightly schooled redfish slowly grubbing through the shallows. Most anglers use floating lines at this time, when the water is gin clear. You can see fish at greater distances, but the reverse is also true, and of course the breeze is always blowing at least a little. Tail: Chartreuse Zonker strip extending rearward from the eye. Tie in a few strands of Krystal Flash material on top of the Zonker. 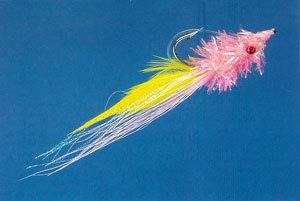 tie in a small pinch of pink bucktail on top of the flash. Weedguard: 30- to 40-pound monofilamentNote: These are summer colors for the Lowcountry Electric Chicken as originated by Capt. Jack Brown. Winter colors for the same fly would be purple, black, or root beer. A sinking shooting line cuts through the wind, allowing you to stay undetected farther off the fish. It also sails long and true, turns over a bulky crab fly nicely, and then holds it on the bottom much better than a floater does. The most enjoyable fly fishing for spottails is sight casting on low-tide, shallow flats. But sometimes we have to fish transition water while waiting for the right tide. Fish often stage near points and oyster-bank drop-offs while waiting to move into high-tide haunts or when retreating from them in falling water. Retrieving a fly from shallow to deeper water often tempts a strike, and the sinking shooting head is perfect for this scenario since the longer the line is in the water the deeper it goes. A floater will hold your fly too near the surface. I found a third situation by accident this past fall. While searching for redfish with a jig and an electric-chicken plastic trailer, I felt a soft tap that was not a red. I was working several yards from a shoreline in about 10 feet of water, and the jig found a school of trout holding well below the surface. Once the tide drops away from shoreline grass, speckled trout tend to stage in intermediate water away from shore. They are suspended deep or just off the bottom, and with the strong currents produced by South Carolina’s 8-foot tide, a floater will not reach them. But I picked up an 8-weight rod with a 300-grain shooting head and an Electric Chicken fly, and I caught 20 trout in about as many casts without moving the boat. When you are fishing from a boat, most casts do not need to be exceptionally long, just accurate and sometimes quick. With proper boat positioning, casting 60 feet of line is normally plenty. The following technique allows you to throw 60-foot casts effortlessly, which is important when we make hundreds of them in a single outing. First, strip the 30 feet of weighted line off the reel and then another 30 feet of the running line. Make false-casting strokes while feeding out line until the end of the weighted portion is about a foot outside the tip of your rod. Unlike with standard lines, it’s easy to tell the weighted portion from the running line since they are different colors. Then, on the next forward stroke, shoot the remaining line toward the target. The shooting head will easily carry the remaining 30 feet through the air even without a double haul. In a typical fishing situation, where the fly is retrieved to about 15 feet from the rod tip, a proficient caster will take one false cast to get the whole head back outside the rod guides and then shoot the remaining line on the next forward stroke. With floating lines, fairly long leaders are normally employed to avoid having the line or its shadow spook fish. With shooting heads, the presentation is subsurface and spooking is less of a concern. The objective is to have the line drag heavily weighted flies along the bottom or take lighter flies near the bottom and hold them there. Short leaders do the trick and also are better for turning over heavy flies. For trout and redfish, a 6-foot-long leader is about right. Start with four feet of 40- or 50-pound mono, and tie a perfection loop or surgeon’s loop in one end to loop it to the fly line. Next, connect about a foot of 30-pound leader with a surgeon’s knot or a blood knot. Tie a perfection loop at the other end to complete the leader. Then make an 18-inch fluorocarbon tippet out of 15- or 20-pound test material with a perfection loop at one end and the fly at the other. Some people use all fluorocarbon, which is fine, but at least the tippet should be fluorocarbon. Sometimes, it doesn’t matter if you use shooting heads. On those perfect days when the wind is nonexistent and you are poling along, working to tailing spottails or casting to cruising fish along a quiet shoreline, a floating line with a long leader will do the best job. But on those days when the wind roughs up the water and keeps blowing the fly just past my ear, I would prefer to get that hook somewhere near the fish. Shooting heads will help do that job.